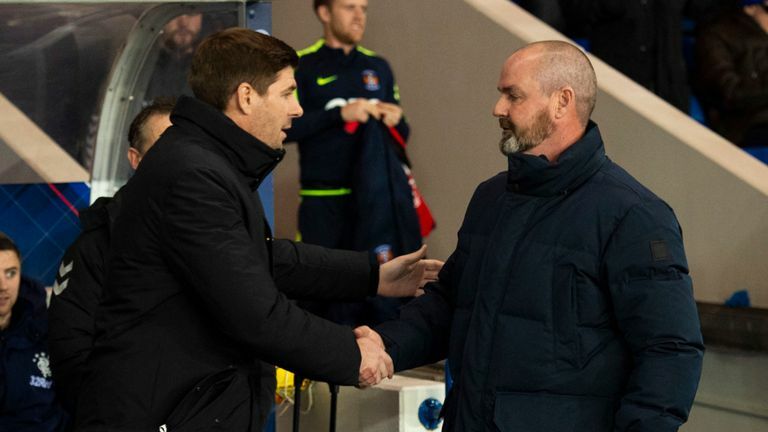 We’ll have match reaction from tonight’s dismal draw with Killie as we go on, but two things were patently obvious – Jermain Defoe cannot play as a lone striker, and Steve Clarke has Steven Gerrard’s number. Whatever happened in the build up to this one, whatever words were said, Gerrard’s 4-3-3/4-2-3-1 depending on what moment in the game we’re at, simply wasn’t functioning against a well-drilled Kilmarnock side who were far more threatening, far more dangerous, way better organised and infinitely harder working. A drab match overall was caused by Killie shutting Rangers out, true, but it was Killie who came far closer to scoring, despite having less shots and shots on target. And it sure wasn’t helped by a Jermain Defoe display completely out of his comfort zone trying to be one up top and completely failing. Not his fault – Gerrard was wrong to say on the unveiling that Defoe could play that role. He can’t. Quite honestly we don’t know why we signed Defoe – he has scored a couple of useful goals, yes, but where he fits in to Rangers’ overall vision is a mystery to us. And Steve Clarke once again got the better of Gerrard – true, it was only a draw, not a home win, but few would have argued had Killie gone to the next round on this performance. And remember this is a Killie who have no wins in the past three, including a horrible draw against Dundee. Bad night for Gerrard, bad night for Rangers. Must do better. We are too predictable and easy to shut down. Our transition from defence is crap, square ball garbage. No creativity in midfield to split open a defence. No one making runs because when they do they are ignored in favour of a ball to tav/ Candeias who in turn will eventually throw a 1 in 20 success rate cross into an empty box. When Kent is double teamed as he was today we have no edge and are a counterattack away from s defeat at any given moment. You can tell within 5 mins if we are in for a long boring game and do it panned out again. We need to get better with faster transitions and variety of play against teams who sit back. Spot on Zzikester. Couldn't agree more.. Excellent summary. Saves me the bother. I would have argued had kilmarnock went through! I think your being a bit harsh. They didnt have the better of it, they didnt deserve to beat us. They are a stuffy, organised hard working team. Lets see who has whos number after the tie is finished. I am confident we will make home advantage count! I do agree defoe isnt great playing upfront himself and i would have liked to see lafferty and defoe together but i can understand us flooding the midfield because it was always going to be a battle in there! Half time....Lets go! You don't know why we signed Defoe?? - Funny, you seemed to know the answer a few days ago Ibrox Noise did you not? Quote "Did next to nothing then scored a killer goal. That’s why he’s at Ibrox. We’re really warming to this lad"
- Make your mind up, your starting to contradict yourselves on a Chris Sutton level..
Defoe has played plenty of times up top himself and scored plenty whilst doing it wherever he has played. The problem tonight was Gerrards tactics plain and simple. Arfield wouldn't be in a Walter Smiths reserve team, not once did he play a killer through ball to Defoe. Funny enough, that is why we signed Davis! Candieas is the only winger in world football who has never took a player on...He's a blouse who runs about mouthing off yet everytime he gets the ball he kicks it first time into anyone in the box(usually the opposite team) or he passes it backwards. Kent was also a tad greedy on his side. If someone was playing balls for Defoe to run onto or even decent balls from the channels then he would have probably scored(It's what he does after all. Remember how you praised him for doing it in the Dons game!?) Doesn't matter who was up top tonight. The got no service, period. Our creative players like Davis and Middleton where mysteriously left out...Again with illness or some other garbage excuse from Gerrard. Curious. You attacked everyone EXCEPT Defoe? Gerrard killed us today with his abysmal tactics - Not enough bravery and not enough quality on his part. He spend what £2m or whatever on Barasic yet doesn't have the confidence to trust him in certain games and instead plays Halldiday! That's poor management. Not that Halliday is bad but Halliday in the middle of the park is more creative and works harder in a couple of games than Arfield probably will all season. He plays Defoe up front himself yet Leaves Davis on the bench(ill apparently) who could get service to 1 up top, he plays Candieas who has never taken a player on in his life and puts in 1 decent cross in every couple of dozen whilst Middleton is left out again. He should have known after 20 mins that Defoe would be ineffective without service and changed something...but didn't! in fact he does what he usually does and stands lost. If you play one up top then surely your priority is to get service to that player or you are rendering the tactic useless? Davis or at least Halliday or someone who can play a decent through ball and drives at the opposition...certainly not Jack, Mcrorie AND Arfield who are possibly 3 of the least creative midfielders in the squad! and you put people on your wings who are direct, who run at players, who get behind players and get the ball into the lone forward. Middleton? When you have guys like Davis, Defoe, Middleton, Lafferty and you have options to play the left back you spend a fortune on and get some creativity in the middle, and you have the option with Lafferty to play two up top but you opt to do neither then it's very worrying. Especially in a cup game and doubly especially when that team has 3 ex Gers players who were past their best a decade ago!! Gerrard shat it tonight, plain and simple.. The game was always going to be a battle due to that plastic pitch pulling everyone down to the same level .This time we put out a side who could compete in the battle and did enough to bring them back to Ibrox.I think S.G was happy to do that as the game went on, hence he kept subs until late . Don`t agree he has S.Gs number , so far the score is 1-1 and 2 draws and we had learned what was required after the last game.Its easier to kill a game than play classy football and thats what Clarke sets out to do .Apart from the stramash in the first half and wee baldys free kick they had no chances.We had a missed pen , Defoes chance , Worralls missed header,so it was close but they certainly didn`t deserve to win. A draw would have been a disaster in the league but in the cup it can be rectified at Ibrox . I would note that Sutton, not known for his love of Rangers, thinks Killie should have been down to 9 men by halftime. Don't agree that Kilmarnock deserved to win more than us. We were poor but not that poor. Clarke gets results but his brand of football is the most negative, stifling, unambitious and boring type of football. His team have got as much personality as him. Thank God we don't have to watch that every week. The service for Defoe tonight was poor think we can all see that. One nice through ball from McRorie that was it. Crosses weren't great and food and drink for their tall back four. I would say that horrendous surface killed a lot of our attacking play we couldn't pass the ball as quickly as we wanted to and they picked up a lot of second balls which stifled us in attack. No need to panic no need to worry we have more than enough to beat Killie at home. Only thing that disappointed me from the managers point of few was the fact we made subs so late on in the game. Think Lafferty and Davis could have done more if on the pitch earlier. Try Defoe & Lafferty as a wee expirement. Lafferty should be hungry again, by now. Honing in on the goal again. It would benefit Jermain, too. Seems a no-brainer. Can we afford a wee try, though?